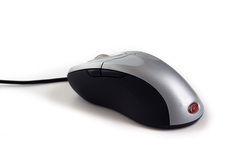 Show the Certificate to your instructor to prove that you can use a mouse! At the end of the Pre-test, close that window by selecting the X on the top of that window. In some browsers you may need to select the X on the window tab to close a window. If you need help, contact your instructor. Did you show the Certificate to your instructor? Then, you may continue below! Earned the Pre-Test certificate, proceed to Keyboard. Did not earn the certificate, proceed to the Mouse Lesson.